I love to use hand painted yarn in my weaving. I purchase virtually all of it from the talented Tammy of Yarntopia Treasures. Tammy’s color sense, the way she blends colors that coordinate and contrast in her yarns, really appeals to me. While I’ve been recuperating, I’ve managed to set myself up so I can wind all my newest Yarntopia yarns into balls and still keep my leg elevated. The batch of them together is so beautiful, I had to share it. On the left are yarns made from 100% bamboo, on the right are TencelÂ® (a particular type of rayon). Both make handwoven scarves that are really soft and drape beautifully. If you’re not familiar with the term, hand painting is a time consuming process. Each hank of yarn is first prepared to accept the dyes. It is then laid out on the dying surface, and very concentrated dyes are carefully applied in spots along the length of the hank, with the colors blending to create new hues where they overlap. The hank is then wrapped and rolled and put into a steam bath for an hour or more. After that it may require another process to ‘fix’ the dyes before it’s rinsed and hung to dry. As you can imagine, hours and hours are involved, as well as lots of underlying talent to select great colors. Tammy makes sure that she uses safe dyes and earth-friendly processes. I can’t wait till I can start weaving with these beauties! Your turn: where’s the color in your life? I love her yarns, too. but i have not had good luck weaving with the variegated yarns. I can’t seem to get the colors to line up nicely. 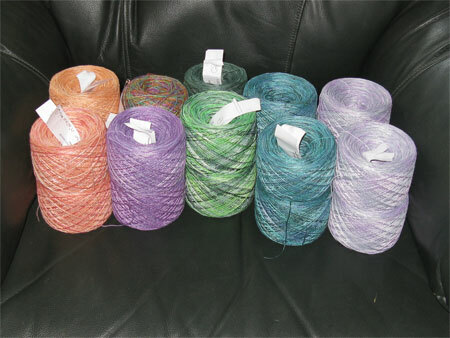 do you use the same variegated yarn in both the warp and the weft? do you mix any solids with them? any tips to make wonderful use of her colors would really be appreciated.